When the summer is coming, it is time to shop for summer staple. When it comes to footwear for this time of the year, nothing would be more iconic than a pair of boat shoes. A high quality pair of boat shoe would never disappoint you. They are versatile and stylish, which you can wear with a lot of clothes in your wardrobe. They are also comfortable for you to walk on it all day long. Its Main Features: This shoe is made from canvas material with rubber sole. It features canvas upper with moccasin style toe stitch. There are 2 options of colors for you to choose from including khaki and navy. It is made with soft fabric lining, which is easy on the foot. So that you can enjoy wearing this shoe without socks all day long without feeling uncomfortable. In addition, it is faded with cushioning on the foot bed to support your feet while you are walking as well. The cupsole made from rubber which is super grippy, allowing you to walk on slippery surface with no difficulty at all. The construction of this boat shoes is quite firm and durable with fine stitched lines around the top of the shoe. This shoe takes a bit of time to break in. The heel drops a little bit in comparison with other boat shoes- which might not be up to your liking. Verdict: This shoe is the perfect choice for anyone who wants casual boat shoe within a tight budget. Its Main Features: This shoe is made in leather with rubber role and rawhide laces. The design of this shoe features moc-toe stitching and classic around-the-collar 360-degree lacing. You can choose from various colors including coffee bean, navy, tan and black. With a lot of different colors and designs, you would be able to find the one that matches your needs and preferences of style. 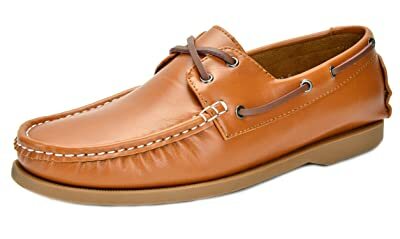 The moccasin style of the stitching line is one of the most beautiful lines on boat shoes that I have ever seen. These lines are clean while subtle, not to mention that they are nicely stitched for an elegant and long lasting look. The foot bed of this shoe is cushioned with high quality EVA foam to bring you the most comfort while you walk on this shoe. It is well ventilated with breathable material so of course, you can wear it in the summer. Still, the shoe is quite warm as well. With its dark color, you can also wear this shoe in the autumn as well. In my opinion, the laces are a little bit light which might be town while you type them. Verdict: If you are looking for a high quality boatman shoe from famous designer, this one is worth considering. It is also more suitable for anyone who wants to have a more classic and formal boat shoe. Its Main Features: This boat shoe is made from leather with rubber sole. It features moccasin stitched toe, rust resistant eyelets and slotted collar. The shaft measures about 2.75 inches from arch. Made by Sperry Shoe Company, whose original founder is the inventor of boat shoe, you are ensured that this shoe embraces all of the pros of high quality boat shoes including the non marking outsole with wet/dry traction and shock absorbing EVA heel cup. This boat shows no sign of poor stitching with solid and heavy construction which is durable and long lasting. The leather of this boat shoe is made with high quality and carefully processed leather to be soft and smooth on your feet. There is enough room for your toe while the shoe would hug your feet nicely for you to walk on it easily. The insole liners would have gotten loose easily and they can be rolled up. Verdict: If you are looking for a classic and essential boat shoe, this shoe is definitely the one that you need to have in your wardrobe. Just like when you like wearing sunglasses, you need to have for yourself a pair of Ray-ban glasses, if you like boat shoes, have a Sperry. Its Main Features: This shoe is made of leather with rubber traction sole. It features moccasin toe stitching and around the collar raw-hide lacing. It is available in many colors including brown, black, sand suede, brown elk and white. 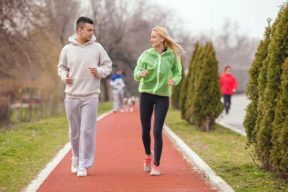 The insole is made with molded EVA foam and the footbed is dubbed with extra cushioning to support your feet and make them feel comfortable when you have to walk for a long time. It is made with non slip, non marking rubber outsole so that you can easily walk by slippery surface leaving no dirty mark behind. With a wide range of sizes for you to choose from- with normal, narrow and wide option, it would be easy for find you a pair of this boat shoe which would fit great and make you feel comfortably. This boat shoes is available in various colors for you to choose according to the style. 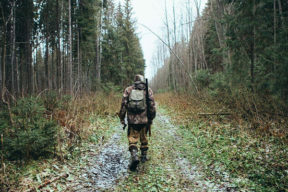 There are several options of width for you to choose from including narrow, medium, wide and extra wide. 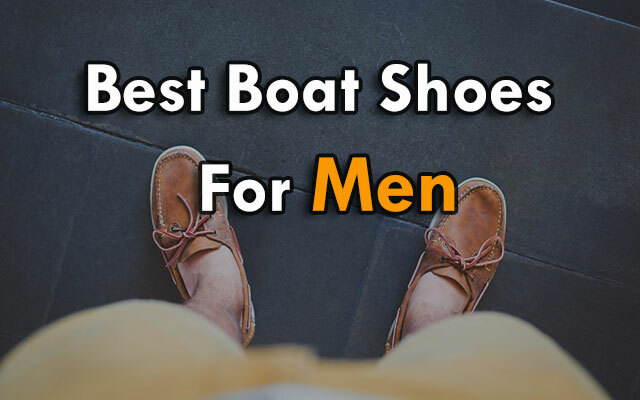 The finish of th eleather is a little bit rough and dull in comparison with other leathe boat shoes for men on this list. The rawhide laces of this shoe are quite stiff. You might feel that it is a little bit difficult to tie these laces. Verdict: In case you are looking for a rough and casual boat shoes for men which is more of a functional shoe than a stylish shoe, you can consider this option. Its Main Features: This shoe is made from synthetic material with rubber sole. It features moccasin toe stitching and around the collar raw-hide lacing. It is available in many colors including brown, black, navy and tan. This shoe is one of the most outstanding shoes with distinct look of moccasin toe style and stitching vamp along with slowly low heel. The synthetic material of this shoe is made with top notch quality to be as comfortable as cotton and as good looking and expensive as leather. In addition, the colors of the shoes are quite sharp and vibrant. And they can retain their shades of colors well even when you have to wash the shoe several times. Unlike leather boat, shoe, this shoe takes only a bit of time to break in and feel comfortable on your feet. 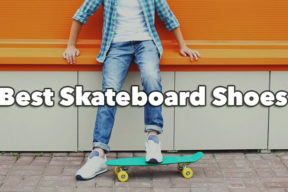 The insole quality of the shoe is of less quality than other insoles from other boat shoes on this list. 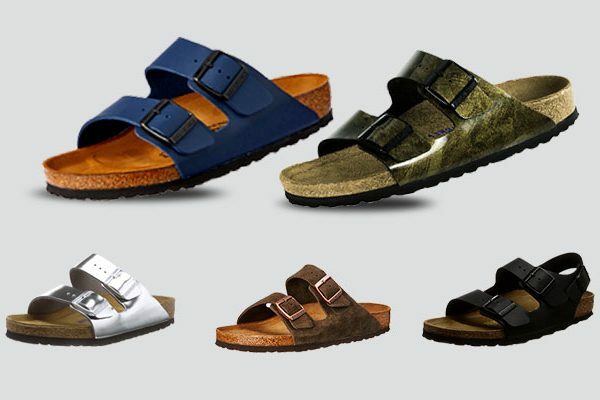 It comes with latex cushioned footbed which is not as so comfortable and well ventilated. It is available in regular fit size only. If your feet are narrow or wide, there are currently no options for your fit at the moment. Verdict: While the shoe above, the Sebago Men’s Docksides Boat Shoe, is made for quality, this shoe is suitable for anyone looking for stylish and unique shoe rather than a functional boat shoe. Its Main Features: This boat shoe is made from real leather with rubber role. The design of this product represents a moccasin toe loafer with 3 eyelet lacing and slotted collar. The height of the heel is 0.75 inches. There are 2 options of colors for you to choose from including tan and raisin. This shoe is made carefully with the beautiful and nicely stitched 360 degree lacing, contrast stitching lines and smooth leather. The rubber outsole of this shoe is extremely flexible allowing you to have good grip when you walk on wet and slippery surface. The construction of this shoe is very sturdy and solid with firm sole and body nicely stuck together for a durable and long lasting boat shoe. This shoe is suitable for both smart casual and casual wear. It makes you look stylish without being overdone with your style. Also with its two solid colors, you can enjoy wearing this shoe with many of your clothes. Uncomfortable tounge of this shoe is not supportive and comfortable with the top of my foot. It is a little bit narrower than other types of boat shoes that you can find on the market. Verdict: In case you are looking for a high quality boat shoe that also looks classic and tradition, you can consider this option. Also with 2 options of solid dark colors, you can consider buying this shoe for more formal events than casual events. Its Main Features: This boat shoe is made from real leather with synthetic sole. It comes with the design of a sport shoe with moccasin toe and slotted collar with rawhide lacing. 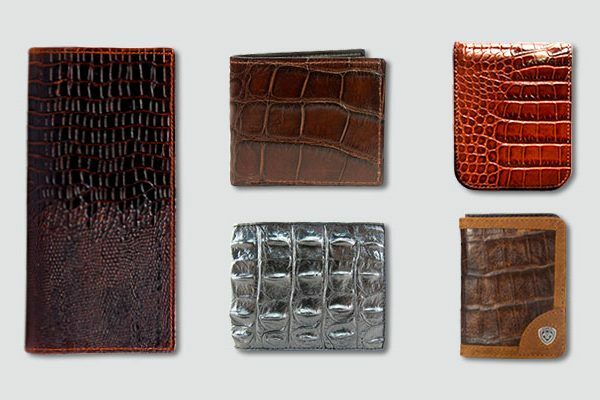 There are several colors for you to choose from including brown, dark brown and navy. It is one of the boat shoes with high profile of the heel, which would make you appear to be taller. This shoe is available up to size 15 while other shoes are only available up to size 13. So provided that you have plus size feet and find difficulty choosing a boat shoe that fits you perfectly, this one offers a great solution for you. 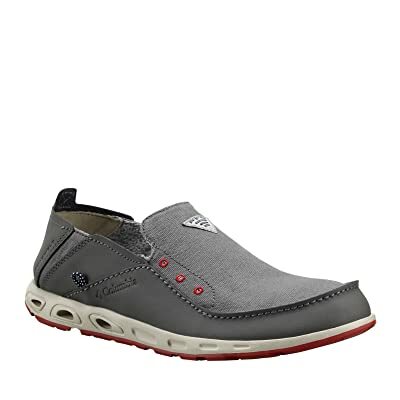 The footbed of this boat shoe has EVA insert with the innovative and high quality Poron foam to make sure that your feet have the best support while walking all day long. The rubber outsole of this shoe is super grippy and non marking so that you have the maximum traction while walking on slippery surface. The premium leather upper is handsewn nicely and beautifully for a very expensive look. The leather can scratch quite easily so make sure you apply proper care while wearing this shoe. It is a little bit heavier than other boat shoes on the market. Verdict: In case you are looking for a boat shoe with a sporty look, this boat shoe is for you. It is suitable for you in different occasions including going to work or going on a boat. Its Main Features: This boat shoe is made from textile fabric with rubber sole. You can select among 11 different styles and khaki including navy, black and white. The construction between the upper and outsole is vulcanized for a very solid and secure bond- which contributes to a heavy duty construction of the boat shoe. In addition, the 360 degree lacing system has rust proof eyelets or extra durability. You can enjoy taking part in water activities or walking in the rain with this shoe. Not to mention that the rubber outsole is made with trademarked technology, the Razor Cut Wave Sipping for ultimate dry and wet traction. It is also non marking leaving absolutely no dirty marks on where you walk in. The material of this shoe is of high quality material to be very soft, comfortable as well as durable. Leather boat shoes might not be wearable when they become old and worn out. On the other hand, canvas boat shoe like this model has a very interesting and unique look when it is worn out. The rubber sole is quite squeaky and noisy when you walk on hardwood, tile or cement floor. The inside heal top is stithced, which makes me feel a little bit rough on my foor while walking. Verdict: If you are looking for casual boat shoe with a casual and simple look for a few summers, this one is for you. 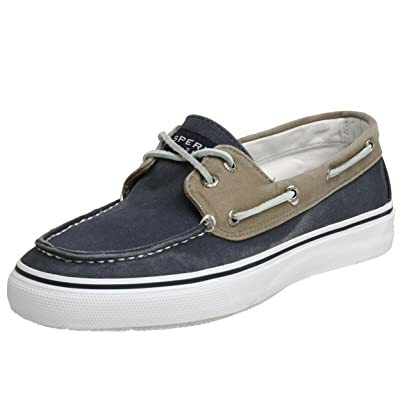 Its Main Features: Here is another canvas shoe from Sperry. This boat shoe features moccasin toe construction with contrast stitching and 360 degree lacing system. It also comes with rubber soles. There are 11 colors for you to choose from including navy, brown, white and black. First of all, this shoe comes with a memory foam cushioned insole, which adds more comfort for you when you walk for a long time. The construction of this shoe is made with 2 eye vulcanized construction to be very durable and solid. 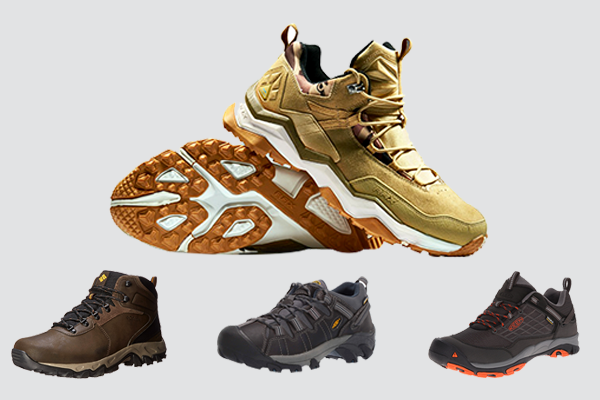 It also offers you a great deal of arch support and high energy return for you to walk on rough terrains and surfaces without any difficult at all. The outsole of this shoe is non marking and supper grippy against slippery floor, just like the quality of high quality, premium boat shoes that you can find on this list. 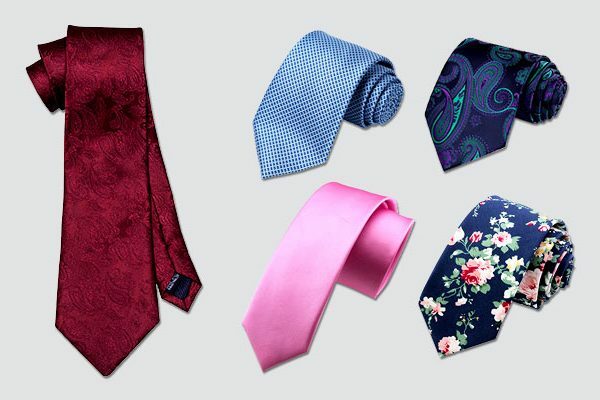 There is a wide range of colors for you to choose from with different shades and patterns to match with your specific style. It is also easy to pair this boat shoe with other pieces of your clothing. The cushioning insole of my shoe is cut off halfway and that makes me feel quite uneasy to walk on this shoe. This shoe runs a little bit smaller than other boat shoes of the same sizes that you can find on the market. 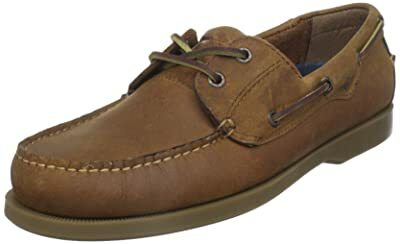 Verdict: This boat shoe is the great choice in case you are looking for preppy footwear to go with your preppy styles. Its Main Features: This boat shoe is made with leather and synthetic material. 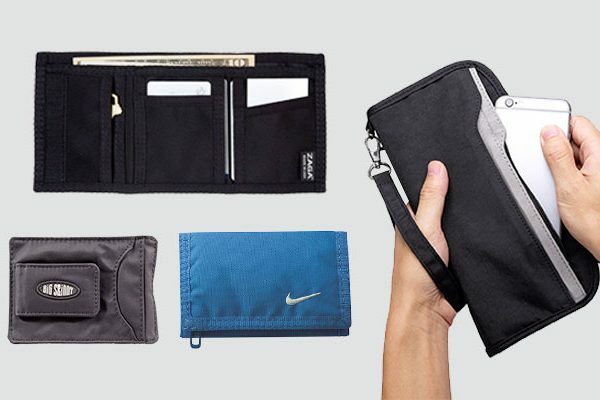 There are several colors for you to choose from including grey, navy, red and black. This boat shoe is very soft and smooth. With its smart design, you would find it easy to slip on this shoe and wear it without socks. The material of this shoe is not only smooth and soft, it is also breathable and well ventilated so that you can enjoy wearing it in the hot summer day. The midsole of this boat shoe is made with Techlite technology to be very lightweight, cushioning and to have a high energy return for you to walk on effortlessly. Last but not least, this shoe is one of the few shoes that have air flow and water drainable features you can wear it while taking part in water activities. The tad of this shoe is a little bit narrow for me, which makes me have difficulty standing on it. While offering a great deal of arch support, this shoe is a little bit too high for the middle section. Verdict: This shoe is an ideal choice for anyone who wants to buy comfortable slip on shoe. Also a great choice if you have to go to humid place. As you can see, boat shoes are made from a wide range of materials- from leather, synthetic material to canvas. They are also available in many colors including bright and colorful as well as dark and neutral colors. With a lot of brands and models on the market, I am sure that you would be overwhelmed by all of the options you might have. 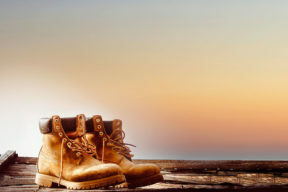 Therefore, I hope that with this list of the best boat shoes for men above, you would be able to scan quickly and find the one that you want to buy and add to your existing wardrobe. After all, your summer would not be complete at all if there is no pair of boat shoes in your footwear collection!! !